Gary Coyle’s Into the Woods is superb. You have to be there in the gallery to get a sense of what he is doing. The exhibition is conceived and delivered as a single, immersive installation. Walk through the door and you have the uncanny sensation of having wandered into a drawing. That could be because you have wandered into a drawing. Coyle has transformed the gallery into a gothic fantasy, creating a disorienting space that blurs the line between inside and out. 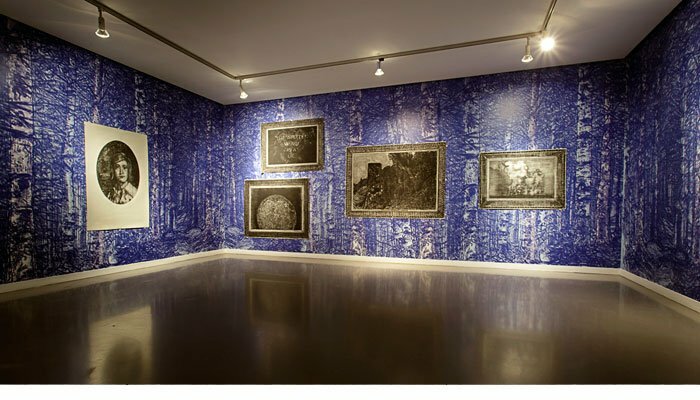 The walls are covered by a digital rendering of dense woodland, made on a drawing tablet and printed on vinyl. Yet even as the room opens out to give us imaginative access to a fairy-tale space, we are held back by the fact that pictures hang on the walls. Or rather, black and white charcoal drawings of paintings, complete with elaborate, drawn frames hang on the walls, so that the whole thing is like a representation of an 18th-century picture gallery. Each drawing is densely worked and dark. An explanatory text helpfully details the icongraphic make-up. Coyle once, appositely, titled one of his shows Southside Gothic. These recent drawings build on his habitual imaginative world in which the gothic is reworked with reference to contemporary cultural idioms, from cult horror thrillers to more arcane areas. The explosion depicted in 27/7/1979 The Death of Disco, for example, did take place on the specified date, in the US. It was a bizarre promotional event involving the destruction of a vast crate of disco records, which veered out of control. Another preoccupation is visibility: what is seen and unseen, the observer and the observed, the unseen observer and the prey. In terms of the images, though, what you see is what you get. To his credit, Coyle does not mystify his work. He just encourages us to look and ask ourselves what we are looking at. While he has used photography, documentation, writing and performance, he remains exceptional in placing drawing at the very heart of his work.